Teaching Blog Round Up: Summer TIME! Hi guys! It is Teresa from Fun in K/1! I hope you are all enjoying the Teaching Blog Round Up! Summer time is here! (or almost here for those like me who still have a few days left of school) Now that I have finished my math series, I love having time to teach the kids additional math. Time is always fun to teach and the kids have a ball learning how to tell time. 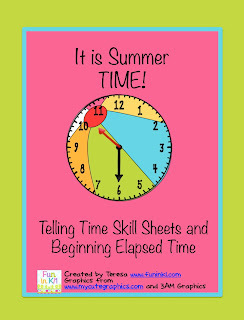 Here is one little tip I have to help the kiddos when they are first learning to tell time and doing time telling skill sheets. I always have them find the little hour hand first and circle the number it is pointing to or just past. Then we write the hour. Now for the minutes I have them write the minutes by 5 around the outside of the clock. (This also gives extra time skip counting.) Then we figure out the minutes. Here is a Summer TIME freebie for you. Click HERE to download it or you can pick it up free at my TpT store. An introduction to elapsed time with word problems is also included. This is often a tough concept to grasp, so starting out early is a good thing. Speaking of summer, I just wanted to share a few summer reading incentives out there. Books A Million is offering a Summer Reading with Carl Hiaasen program. Kids will read 6 books from the BAM summer reading list, parents will sign and then bring it to any BAM store to receive a free Hoot or Chomp backpack. The list includes some great books to choose from. Click here for more details. Barnes & Noble has a fabulous free reading incentive as well. Students read ay 8 books, complete the B&N journal and bring it in to receive a FREE book (from a selection of books). Click here for more information and the form. Scholastic is also running a Summer Book Challenge. Teachers log their students in and then they track their minutes online. They have a school wide program as well. Click here for more information. I can not wait for the summer to read! I will hopefully have more time to read for pleasure , even without a summer challenge! What are planning on reading this summer? Don't forget to add Teaching Blog Roundup to your summer reading list. Hi Teresa! Super blog - I will add it to my reading list regularly! Give me a shout if I can ever help you out! Thanks for the great freebie! I am so excited to be a part of this blog and am pumped for my post on the 30th!! Thanks for the time freebie!